Phelps wore a monofin to help him swim through the water like a shark. The most decorated Olympic athlete of all time competed against one of the world's top predators in the one thing both do best: swimming. Michael Phelps stopped by "Good Morning America" to discuss some of the amazing details from the day he raced a great white shark in open waters. Phelps teamed up with the Discovery Channel for the race, which was held off the coast of South Africa as part of the channel's "Shark Week." "This has been something I've wanted to do my whole life," Phelps told "GMA." "This has been on my bucket list a long time and you know, being able to see these animals up close and personal in their own environment is something that was just such a treat." Phelps tested the waters, so to speak, by taking a preparatory dive with the sharks ahead of the race. "I had a white's nose come a little close to mine when I was in the cage, her mouth kind of just clamped right down on one of the bars. But I basically just sat down there for about an hour and just watched sharks swim right past me," he said. Racing a shark is no easy task, Phelps said, as they can reach speeds of 25 miles per hour while swimming. But the Olympian said his biggest challenge wasn't his animal competitor. "The biggest thing for me is open water. Being in open water is so different from swimming in a swimming pool," Phelps said, explaining that the water temperature during the race was also very cold. "It was like 53 degrees, so that’s about like an ice tank, that added a little twist to the equation." 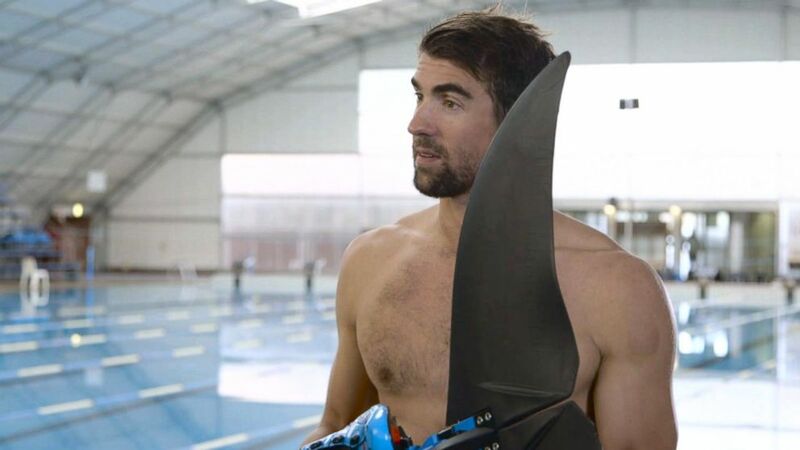 (Courtesy Discovery Channel ) Michael Phelps trained with a monofin for his race against a great white shark for Discovery Channel's "Shark Week." Phelps said he wore a monofin that strapped his feet into a tail-like attachment, allowing him to move through the water like a shark. The 23-time Olympic gold medalist also told "GMA" about how he stayed safe during the race. "Well, we're not in the water at the same exact time. I think that's the one thing we all wanted everybody to know -- I was safe, which is number one," he said. Phelps said that during the race, there were between 12 and 14 divers below him who helped capture the shark's movements on camera. "When you have an animal this size, you want to be able to see how fast they swim," he explained. "And it's tough to be able to go into their territory and swim as fast as they do." The swimmer will also be featured in "Shark School with Michael Phelps," which teaches people what to do if they find themselves in the vicinity of sharks. "It's basically the dos and don'ts of what to do when you're in the ocean," he added. Although Phelps is officially "done" swimming competitively, he said he has enjoyed an incredible career and was honored to have represented his country. Now that he has fulfilled his lifetime dream of swimming with sharks, Phelps said he's considering commemorating the experience with fresh ink that would join the Olympic rings tattoo on his right bicep. He said he is thinking of getting a tattoo featuring a great white shark, a hammerhead shark or perhaps both. "For me, it was an experience I'll never forget," Phelps said. "Being able to be on the bottom, basically, of the ocean floor and surrounded by a number of different species of sharks was one of the coolest things that I've probably ever done." Shark Week begins Sunday, July 23 on the Discovery Channel.